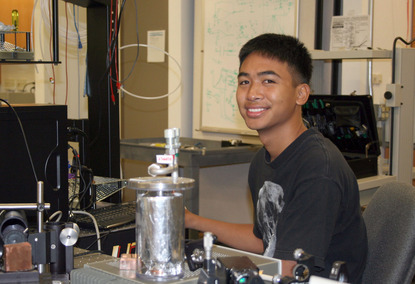 Matthew Parilla, a 2007 graduate of Maui High School, will enter his fourth year at the California Polytechnic State University, San Luis Obispo in the fall. He plans to graduate in 2011 with a B.S. in Mechanical Engineering and a concentration in Mechatronics. After graduation, Matthew plans to work in the field of robotics or aerospace. He looks forward to making important contributions to the technology of the future. He enjoys playing basketball, snowboarding, spending time with family and friends, and playing the guitar. Maximizing the structural rigidity of a telescope is essential for allowing astronomers to optimize image quality and to better resolve distant objects. PLANETS, a 1.85-meter, off-axis equatorial telescope to be located atop Haleakala, will focus on optimizing image quality. To accomplish this, microscopic gravitational and thermal deflections within the telescope system must be minimized. With this goal in mind, I designed and analyzed several components of the PLANETS system using Autodesk Inventor and Algor software, including the observatory building, the polar axis and fork, the mirror and its supports, and the telescope mount. Using the software’s finite element analysis package, I analyzed various parts of the telescope for deflections experienced by the system. Using 61 points of support arranged in concentric circles, the maximum deflection in the mirror due to gravity and thermal effects was reduced to 35.4 nanometers. A lightweight and rigid frame was needed for mounting the mirrors and optical equipment with a target maximum deflection of 50 microns when in the upright position. A steel truss system constructed using hollow cross-sections weighed only 2150 kg and experienced a maximum deflection of 43.2 microns, meeting the design criteria. Additionally, magnetostrictive materials that change in length when subjected to a magnetic field may be used to further minimize the deflection in the system. A solid design base has now been established with this project; further optimization of the components within the PLANETS telescope system will produce better quality images.